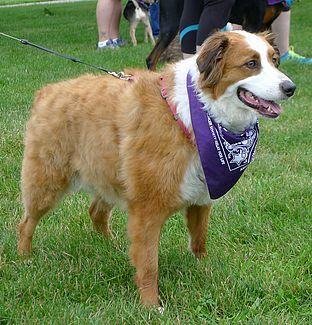 This past Saturday was our local Bark for Life event sponsored by the American Cancer Society. 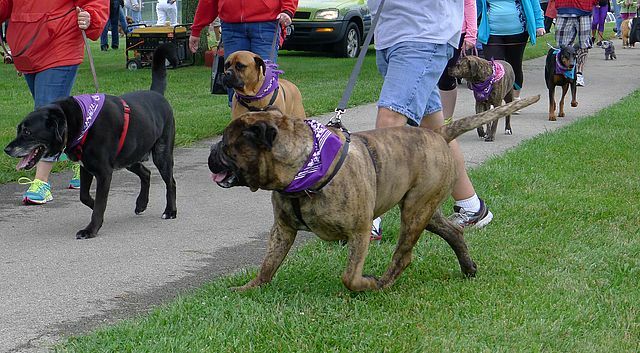 Maybe you’ve taken part in a Relay for Life event before, but have you and your dog ever participated in Bark for Life? This was our first time attending the event with Haley. If you’re not familiar with Bark for Life, it’s a fundraising event honoring canine caregivers and those whose lives have been affected by cancer. For many cancer patients and their family members, dogs play a huge role in helping to provide unconditional love and compassion and this is a beautiful way to honor all of them. Anyone is welcome to bring their dog to the event and join in the walk. The Bark for Life includes a one mile walk with your dog and other fun, dog-related events like contests, games, canine demonstrations, music, food and of course, a little fundraising. Sponsors set up tents where you can talk to various pet professionals, browse cool dog products and maybe even pick up a few samples or freebies. 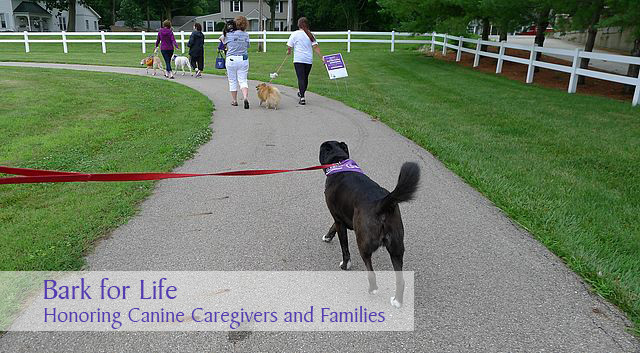 It was heartwarming to hear cancer survivors share their stories of canine companionship during the event. Yesterday, we heard from a local woman who decided to rescue a Rottweiler dog while she was battling breast cancer. She was so grateful for the love, comfort and companionship her dog provided during her illness that now, as a cancer survivor, she has created her own Rottweiler rescue organization. It was an inspiring story of hope, love and giving back. Despite a few sprinkles here and there, the event was a huge success and it felt wonderful to take part in the celebration. Bark for Life events are a great opportunity to meet and support others in your community and celebrate your common love of dogs. It’s also a fun way to exercise and socialize your dog while supporting the American Cancer Society’s commitment to eliminate cancer. If you would like to participate in Bark for Life, check their Find an Event page to search for events in your area. You can register in advance or just show up at the event with your donation. If you participate in Relay for Life, there are ways for you or your team to also incorporate Bark for Life into your fundraising strategy. You may also be interested in organizing or becoming a volunteer at your local Bark for Life event. 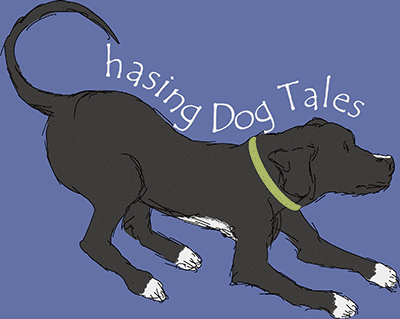 Do you have a favorite dog-related fundraising event? I would love to hear about it! What a great event! Thanks for sharing!! Thanks! We had such a good time there this weekend and it was nice meeting some wonderful people and their dogs. That’s such a loving event. Our daughter is a 2X breast cancer survivor – if we had something like this in our area, she would totally take the boys. Thanks for sharing this, I had no idea. Kudos to you and Haley for attending. As a mom, I can’t imagine how difficult that must have been for the whole family. I’m very happy to hear your daughter is doing well; she certainly is a survivor. I noticed there aren’t nearly as many Bark for Life events as Relay for Life, but I’m hoping people begin to volunteer in different areas to organize more of them. That’s sounds like a great event! 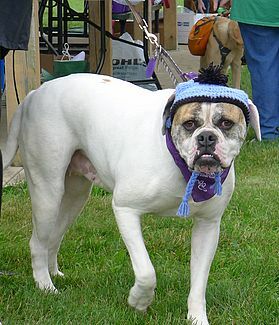 We took our angel Abby to a Morris Animal Foundation K9 Cancer Walk a few years back and it was a great event too. I’d love to take Rita one day, but she’s not a fan of big crowds… Maybe if she keeps mellowing out we can take her some day. That sounds like a wonderful event too, Jackie. There were a few overexcited dogs there this past weekend, but once everyone started walking they settled into a rhythm and relaxed quite a bit. Aww, looks like tons of fun. Glad you got to go. It was a really nice event and I’m already looking forward to doing it again next year! I’ll remind my Human to watch for them next year. We didn’t know about them and any here in the southeast, near us, are long past. I think you would enjoy going to the event next year, Hawk! There’s a ton of different dog walks here but I haven’t taken Mr. N because I feel like it might be too overwhelming for him. It does get a little crazy at some dogs events and I’m sure a lot of dogs like Mr. N would enjoy something more low key. Yes, one mile can be a long walk for a small or older dog. One lady had to carry her small dog during the second half of the walk and several others showed up to just give their support and bond with others. It’s great to participate even if you can’t do the walk or all of the walk. What a great event! I’m a big believer and supporter of dogs helping to relieve stress, improve health, etc. I would love to see more hospitals incorporate animal assisted therapy programs. Dogs are such a joy and really are natural helpers and healers. Isn’t it amazing the effect they have to change people’s lives? We met a therapy dog on the walk that also attends funerals to help provide comfort. Sounds like a great event – going to check for something local. I hope you can find a walk in your area. If not, there are probably other organizations that have a similar type of event happening soon. I’m glad we were able to go this year! Have a great week, Jenna! Sounds like fun and for a good cause. That sounds like an amazing cause! All those stories about people who have battled cancer are so heart warming. It really makes you appreciate how lucky you are, even when you’re not feeling well. I would love to take Cody to a similar event but I think he would be too overwhelmed especially when he already dislikes busy streets! Sounds like you had a wonderful time. What a great event and cause. Sweet photos. Thanks, it was a fun time and definitely for a good cause.